When Dave Hinkle and John Dowd founded Zolar Moving Co. in 1979, they advertised with the slogan “No job too weird.” They were up for anything. Since that time, they’ve moved thousands of families and businesses in the Ithaca, New York, area. Their reputation was built through word-of-mouth. Customers told friends, family, and neighbors that Zolar is the best choice when you want a reliable local mover with reasonable rates and careful, courteous workers. Dave and John are proud that Zolar Moving Co. has become Ithaca’s oldest and most trusted independent moving company. And they are still up for anything. For a list of Zolar’s moving services, please click HERE. John Dowd, on the job in 2004. Photo by Kat Dalton. 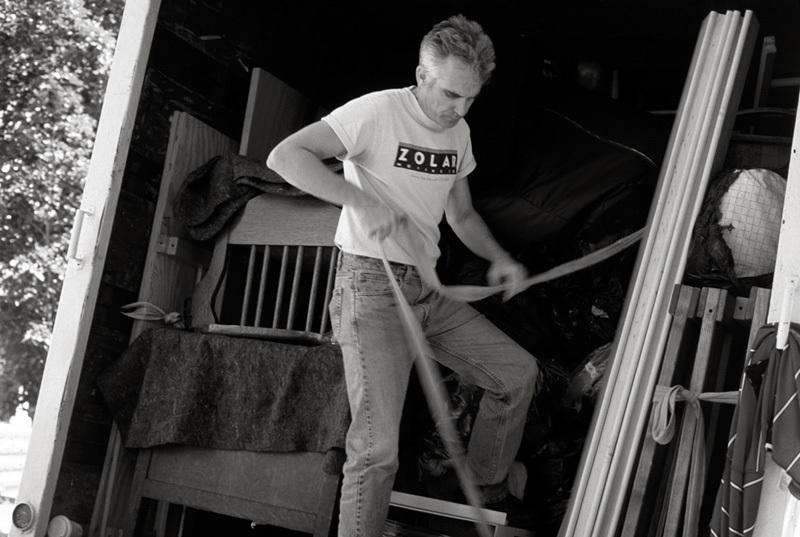 Dave Hinkle taking a break from work in the early days of Zolar Moving Co. Photo by Kat Dalton.